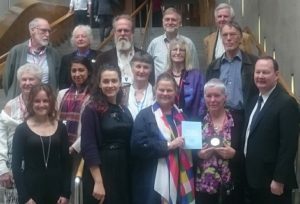 The Nobel Peace Prize medal, which was awarded to the the International Campaign to Abolish Nuclear Weapons in 2017, was displayed at Scottish Parliament on 12 June. 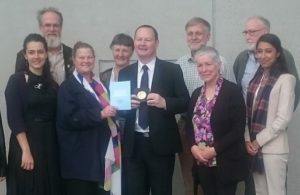 Edinburgh Peace & Justice Centre is one of five Scottish civil society groups that are among the 468 worldwide ICAN partners, who collectively share the Peace Prize. The medal was brought to a meeting of meeting of the Cross Party Group on Nuclear Disarmament by ICAN Co-Chair Dr. Rebecca Johnson. The event coincieded with the Trump – Kim summit. Dr. Rebecca Johnson, founder of the Acronym Institute for Disarmament Diplomacy, reported on last month’s historic women’s walk into the Demilitarised Zone (DMZ) which separates North and South Korea and discussed the recent developments in the negotiations concerning the denuclearisation of the Korean peninsula and the prospects that such events open. In particular, Rebecca discussed what she believes to be essential points of the joint statement released by US President Donald Trump and the Supreme Leader of North Korea Kim Jong-un after their historic meeting which took place the same morning. Dr Johnson stressed that although the statement might appear as not bringing much novelty to the table, it is essential as it establishes a new development of two people working together for peace and prosperity. In this complicated situation, there are three main issues at stake for the Koreans. Firstly, there is a desire for a peace treaty as, since the end of the war in 1953, there has only been an armistice in the region. Rebecca recalled that, during the Korean war, there had been discussion in the American administration about the possibility of using nuclear weapons in Korea. Secondly, Kim is interested in providing prosperity to North Korea for maintaining his position. Kim, a very young leader, is seeking recognition in a region, Asia, in which there is a culture of always looking up at the elderly. To last as a leader and live he needs the support of China and possibly of Japan so that he can achieve economic prosperity. Thirdly, the negotiations may open up a way for the Koreans to open up the society and manage a transition from oppression. In the statement released at the end of the Trump-Kim summit, Democratic People’s Republic of Korea reaffirms the 27th April Declaration released after the meeting between Kim and Moon in the denuclearised zone and commits to work towards complete denuclearisation of the Korean Peninsula. Rebecca noted that every action will need to be built on what Kim and Moon agreed on and the two leaders must continue to be the central actors in the negotiations even though the American involvement is important and the contribution of Russia and China is necessary to achieve a lasting solution. Also, it would be positive if all the countries that were at war in Korea would sign as well. Significantly, in this meeting, none of the actors put preconditions down and during the press conference which took place after the meeting stressed the fact that “war games” in Korea would end. This is important considering that the US has around 70 bases in Korea and that, even if nukes were removed after the Cold War, there are suspicions that US ships carrying nuclear weapons visited these bases a few months ago. Thus, Rebecca concluded, optimism is possible, and experts suggest that disarmament will not necessarily require a long time. Still, it must be kept in mind that the Trump administration positions change quite rapidly and that, while negotiations with North Korea now seem to be on a positive track the US is simultaneously withdrawing from the Nuclear Deal which had been signed with Iran. Rebecca also discussed the importance of the ICAN Nobel Peace Prize, which belongs to everyone who has worked for Nuclear Disarmament, and of the Treaty to Prohibit Nuclear Weapons. Still, she stressed that they will remain just a medal and a piece of paper if campaigning is not continued. The Scottish Parliament can play an essential role in the process by enacting legislation to implement the aims of the Treaty to Prohibit Nuclear Weapons (TPNW). There are steps the Scottish Government can take even within its devolved powers to confirm adherence to the Obligations listed in Article 1 of the TPNW, in particular to enact legislation confirming the Prohibitions on aiding anyone involved in the production, distribution and deployment of nuclear weapons. Such legislation would directly challenge UK basing of Trident nuclear weapons system at Faslane and the transport of nuclear weapons on Scotland’s roads. At the same time, NGOs can get involved in actions such as petitioning for the UK government to adhere to the Treaty and talk about denuclearisation of the British Islands. This report was compiled by Margherita Distrotti and Brian Larkin.